As we’ve been mulling over the restaurant changes in our neighborhood, it got us here at BatteryParkCity.com thinking and talking about how reliant we are on food delivery, more pointedly SeamlessWeb.com. Unfortunately, there are some really fantastic restaurants you can’t get to through SeamlessWeb. Just like our past movie list — here are our favorite places you can’t get to on Seamless Web. Our area is deluged with hundreds of Italian restaurant options. Inatesso seems to be Battery Park City’s best kept secret — although the restaurant is packed nightly, they also have a strong delivery service. Consistent and delicious. One small drawback is that some of us wish they gave us a little more of their delectable bread. Sometimes after a Friday night bender, all you want is a healthy hangover helping smoothie. Unfortunately, Elixir (located in the World Financial Center) is not open on the weekends — nor do they offer delivery service. In comparison with other smoothie offering places, sometimes it’s worth waiting for Monday to roll around. The spotlight at Les Halles is often on their Chef-At-Large Anthony Bourdain, but should really be on their Steak Frites. Although they don’t have a delivery service, if you’re craving a quick steak or a hearty bistro brunch, Les Halles offers takeaway. The best pizza is sometimes the most unassuming. When we have our staff pizza meetings, we often agree on pies from this long standing pizza institution. We don’t know if its the well seasoned ovens but we love their traditional New York style slices. Yum. Tartines and a semblance of healthy rustic eating. Le Pain Quotidien’s new location in Battery Park City offers quick lunch options with a new to-go case. Including fresh and pre-made sandwiches and take away soups. From Tartines to Tajin. Located right off Seamless Web-friendly diner George’s at 85 Greenwich Street. 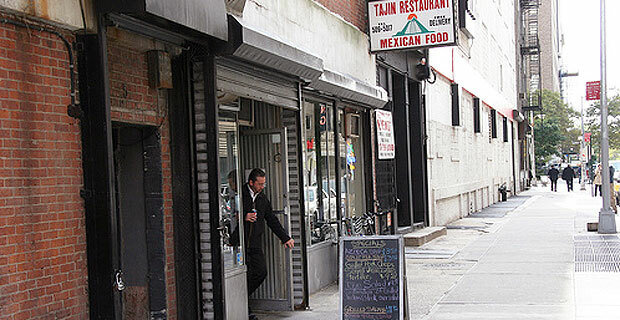 Tajin is one of our favorite Mexican joints in the area. They offer an extensive selection of burritos for delivery, but their sit down menu options are equally impressive, especially their fresh daily specials and enchiladas. Vietnamese sandwiches have taken New York City by storm and we’re big fans of the classic “Baoguette.” Drawing on classic Vietnamese flavors on crusty French breads — it’s nice to see that we have our very own in the neighborhood when our cravings call. If it hasn’t been officially designated, it should be called the first pizzeria in Battery Park City. Where Majestic doesn’t always have the delivery manpower to reach our neighborhood on weekends, Picasso is always there for us. Honorable mention for the fact they have instituted their own delivery system on their website. Our Indian food options are most always in Tribeca. However, Ruchi (which is located amidst the construction and hustle of Ground Zero) offers solid Indian delivery options to our neighborhood. For those who want to venture to the restaurant, they offer a similar 50% off lunch for customers who choose to dine in. Sometimes when 9pm rolls around, delivery options become a barren wasteland in our area. For those with both an empty fridge and empty stomach, Charly’s offers 24 hour delivery to our neighborhood. Sure it’s not lobster and crabcakes — but seriously, sometimes life calls for an emergency burger and fries. Charly’s is the place to get it. The pies here are phenomenal and they offer delivery to Battery Park City as long as you meet the minimum delivery requirement and place your order before 4pm. Did we miss any of your favorite restaurants? Let us know!